To end an action packed Saturday our attention turned to Mexico where the IBF female Light Flyweight title was on the line, as Japan's Naoko Shibata (16-4-1, 5) [柴田 直子] sought to continue her reign and do the double over Mexican foe Alondra Garcia (17-3-1, 1), the woman she originally beat for the title back in November 2013. Sadly for Shibata her 3 and a bit year reign came to end, after 5 successful defenses. The bout didn't seem to start with round 1 of fight 2 but instead round 11 of the Shibata Vs Garcia rivalry, and was fought at a brilliantly high tempo pace which just got better and better as the rounds went on. The high octane nature of the fight wans't just exciting but also compelling with both fighters having their moments in a back and forth round. The back and forth action continued through a number of rounds, with only a number of clear cut rounds either way, such as round 2 and 9 for Garcia and rounds 5 and 8 for Shibata. Unfortunately though with 6 close rounds it was clear the score cards could have been all over the place, and unfortunately for Shibata they were all against here. The close nature of the rounds, and the back and forth highlights that both ladies had, meant almost any score was allowed,though all 3 judges favoured Garcia with cards of 94-96, 92-98 and 93-97. It's fair to say the 94-96 card was the nearest to ours, and whilst we could see the the other two cards they did seem hard, especially the 98-92 card. Incidentally the cards were exactly reverals of their first bout, which Shibata won 96-94, 97-93 and 98-92. A third bout would make sense going forward but we wouldn't be surprised by Shibata taking another option and Garcia looking for bigger paying opportunties instead. Earlier today fans in Saitama saw female IBF Light Flyweight champion Naoko Shibata (16-3-1, 5) [柴田 直子] narrowly retain her title with a razor thin majority decision against Mexican challenger Maria Salinas (11-5-3, 4). The two women had fought last year fighting to a split decision draw with both fighters looking to over-come that stale-mate today. Unsurprisingly however both fought in a really competitive match again today with neither really managing to establish their dominance over the other. The challenger started well, landing several solid shots to Shibata and also seemed to take round 2 before Shibata fought back in rounds 3 and 4 as she began to up the work the rate and pressure. In round 5 Shibata seemed to have a real break through getting Salinas on the ropes but Salinas saw off the threat and fought back in rounds 6, 7 and 8 before put under pressure again in round 9 with Shibata looking to keep the result out of the judges hands. Salinas saw out the storm of round 9 and her toughness saw her see out the final round, though the judges viewed her as second best, losing the majority decision with scores of 96-94, to Shibata twice, and 95-95. For Shibata the defence was her 5th but it's fair to say she won't be inviting Salinas over for a third bout given very little has split them over 20 rounds. Earlier today the Japanese fans at the Korakuen Hall managed to catch their third female world title fight in the less than a week. This time around however the fight fans in attendance got a thriller as two well matched fighters really took it too each other in a real thriller. The bout in question saw IBF Female Light Flyweight champion Naoko Shibata (14-3-1, 4) successfully retain her title as she fought to a thrilling draw with Maria Salinas (11-4-3, 4). From the off it was Salinas, the much shorter fighter, who was bringing the action and taking the fight to Shibata as she found her way inside and set the tempo. The aggression of Salinas was impressive and early on it did look like she was either going to break down Shibata or blow herself out. The start was a dream for Salinas but by the middle rounds she was slowing down and Shibata was beginning to come back into the fight and it was during those middle rounds that the two fighters really engaged in the best 2-way action of the fight. It was also the time when Shibata began her fight back. In the end the action of the later rounds really left the fight close and that showed on the cards with the judges scoring the bout 96-94, 95-95 and 95-96 leading to a split decision draw. Given the great performance of Salinas it would seem great for her to get a rematch, something she deserves, though we wouldn't be surprised by Shibata doing her best to avoid a rematch. Shibata stops Arrazola! Shibata Vs Tada II? Whilst Momo Koseki's successful title defence against Denise Castle wasn't a shock at all we'll actually admit we were shocked by the other female world title bout in Japan as IBF female Light Flyweight champion Naoko Shibata (13-3, 4) stopped Mexican veteran Ana Arrazola (20-10-2, 13) and made the second successful defence of her belt. Arrazola had come in to the bout with the reputation of being a really tough fighter and had never been stopped despite having shared the ring with some genuinely top tied fighters, such as Yesica Yolando Bopp. When you add Arrazola's perceived toughness to the fact Shibata wasn't viewed as a puncher, afterall she hadn't scored a stoppage in 4 years, this one was expected to go the distance and be tough for the champion. What we got instead was a dominant performance from Shibata who ended up showing off what she is really capable of as she beat down and stopped Arrazola in 9 rounds. For Shibata this is the sort of win that really cements her standing in the Light Flyweight division. Some had felt she had been lucky in her previous 2 bouts but this time around she seemed more confident than ever and managed to really impress. It was as if holding the title has instilled a new found confidence in her and right now she has to be thinking about a rematch with Etsuko Tada, a bout that Tada herself seemed to hint at earlier this year. For Arrazola the travel home will be a long one though we would assume she's not going to fade away despite this loss. Shibata defeats Garcia to finally win the big one! "If at first don't succeed try and try again". That old phase came in handy this past Thursday for Naoko Shibata (11-3, 3) who finally won the big one and for the first time in her career claimed a world title. Shibata, who has been a professional for almost 5 years, had come up short every time she has fought a world level opponent. She had lost to Naoko Fujioka, Etsuko Tada and Ibeth Zamora Silva. With the losses to Tada and Silva being very narrow losses in world title fights. Today however it was third time lucky for Shibata who took on the previously unbeaten Mexican Alondra Garcia (8-1, 1) for the vacant IBF Light Flyweight title. A belt last held by Jessica Chavez, herself an excellent fighter. The fight didn't start well for Shibata who suffered a nasty cut early on above the left eye (see picture above) and was tagged by the much younger Garcia, who was fighting in her first world title bout. Things didn't really get better for Shibata who was forced into a tough, tough fight by the young Mexican who hadn't traveled the globe to give up her unbeaten record. Although more experienced Shibata struggled to get the upper-hand and it seemed that every time she was getting a foot hold Garcia would fight back in a valiant effort to take the title back to Mexico. With out a doubt the fight was close and both women knew they needed to make an impression. Unfortunately for both they each cancelled the other out at times making rounds incredibly difficult to score. Fortunately for Shibata, who was cheered on by the crowd, she managed to just do enough to impress the judges that little bit more than the away fighter to take a decision with scores of 98-92, 97-93 and 96-94. It wasn't a robbery by any means, but it's one where the decision went with the home fighter and a 96-94 scorecard either way would have been accurate. Unfortunately the 98-92 card was a bit too wide for our liking. 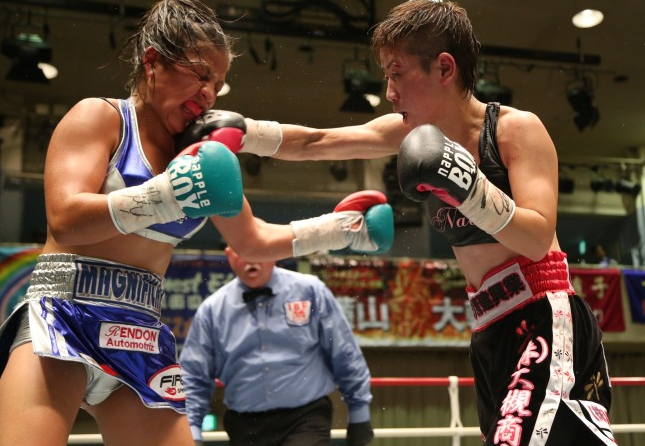 Note-This fight served as the chief support bout on "Earnest Efforts", a card headlined by Momo Koseki defending her WBC Atomweight title for the 12th time.